So what makes the “Request For Proposal” process so special these days? The answer is simple: not a whole lot. Which in my profession is almost a wrenching statement. Over the last few years I’ve witnessed many strategic sourcing projects supported by all kinds of RFPs and their variants, “Quotation”, or “Pricing” (RFQ), or simply “Information” (RFI), and truthfully only a handful of those bidder evaluation mechanisms have proven to really effective. In an effort for sourcing departments to vet more suppliers more quickly, and for the suppliers to be able to respond to more opportunities, both buyers and sellers have affected a massive standardization of questions, terms and responses. It may have made the process more efficient by itself, but it has not only turned the RFP process unexciting, it has rendered it ineffective. Through the RFP, a solicitor should present an opportunity and the bidder should respond with a creative solution given its capabilities - in other words, developing a true business case uniquely drafted to address the opportunity at hand. What it really is (in most cases) is very different from this: solicitors ask a lot questions that won’t address their needs because they are either too generic or so specific that are impossible to address satisfactorily; and bidders respond with boiler plate responses to questions they’ve seen over and over. 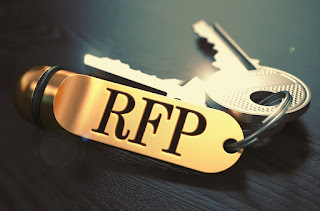 I find that the market has been inoculated against the true purpose of RFPs, and it strikes me that suppliers are offering to provide RFP templates to the organization claiming to provide all “relevant” questions that need to be asked. I mean, how can a supplier know exactly what questions I need to ask, without even knowing what I need? That is not to say that structure and content isn’t helpful to achieve an adequate flow, or that guidelines can’t be provided to nurture the thought process; but let’s not fool ourselves, the main purpose of these template RFPs is to help bidders present winning responses to prefabricated questions. Where’s the strategic value on all this? Why waste everyone’s time on an exercise like this when I could simply ask bidders to provide me with their FAQs? I know this sounds like an exaggeration, but the matter of fact is that I see a lot of companies running RFPs for the sake of complying with their 3 bid process requirement, and I see suppliers presenting the same responses to the same questions to everyone; then making the selection of a true business partner either more difficult and time consuming – with subsequent rounds, revisions, and complex negotiations, or just too naïve and unproductive. We need to get back to the purpose of an RFP as the first step in developing a relationship with a new services provider, or in re-evaluating an existing relationship – in both cases the goal being to create stronger partnerships. When viewed from this angle, it naturally means that RFPs must be approached analytically and strategically. After all, this is a Proposal request, not a FAQ request. By definition, a proposal should be the resulting recommendation to a specific need, based on capabilities resources or expertise; to this purpose, an RFP must define a need and an RFP response must present a solution that solves that need and adds value - a positive return over investment. Though this is a much more challenging approach to the typical RFP process, it is the only one that nurtures success, true delivery, and a long-term business partnership. Keep in mind that Supplier Relationship Management (SRM) begins with the supplier selection process; and the RFP is the first filter at which point delivery performance metrics must be established, qualitative commitments defined, and true value, not just competitive pricing, presented. In short, don’t think in terms of responses, but instead of proposals that can be measured from an ROI perspective. A properly managed RFP process will then aid in identifying candidates that are not only culturally aligned but strategically synergized. As a participant, true proposals should defy the status quo, presenting creative solutions to common problems and innovation to new ones. Source One's RFP administration experts will be at ISM2016, where Source One is the exclusive sponsor of the Exec IN forum. Want to save on registration costs to attend this landmark event? Learn more over at SourceOneInc.Com. Strategic Sourcing Fees: What are my options? Want to save on ISM2016 Registration?